What if I told you there was a fun gig where you can play to a captivated audience that is there to really dance, and you can play almost any style of music that suits your tastes? What if there was a gig that takes place during reasonable hours so you can enjoy a set without staying up until 2am and tanking your liver in the process? For some DJs – like myself – Ecstatic Dance is a welcoming home where my creativity can flourish. While it’s not for everyone, all DJs should be aware of the format behind these gigs as a useful tool that can be utilized in every DJ set. A great night of music is not unlike a play or a movie, telling a story that moves people through a process. We have all heard the complaint “It sounded like the same song all night long!” That problem is a direct result of some DJs not playing with emotional arcs that weave through the songs. Fortunately there are many kinds of emotional arcs and archetypes that we can utilize to pull people into the story line. In a popular past article, I demonstrated how the 5 Rhythms system follows a natural pattern that people inherently understand at a subconscious level. When we get hooked into a story, a movie, or a DJ set at that fundamental of a level, it really becomes magic. The Ecstatic Dance format is another archetypal story line that you can follow, integrate, or re-engineer for your own sets. Keep reading for my insights – as well as my exciting new release of original music designed specifically for this format. Photo of me performing at Ecstatic Dance Los Angeles – photo credit to them! 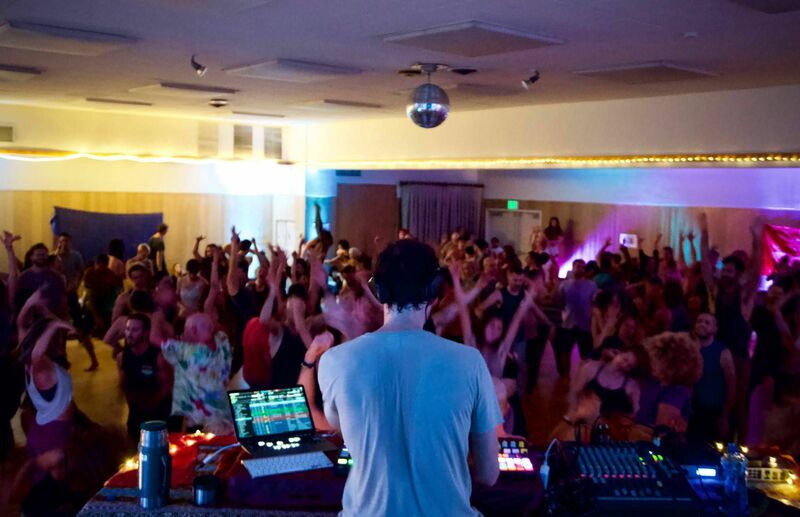 Falling much more in the yoga and mediation world than nightlife, Ecstatic Dance is a way for people to move their bodies, enjoy amazing music, and find community in a space that is welcoming of all types of people. It evolved out of the worlds of open floor and 5 rhythms, where people wanted an intentional experience with high quality DJs. What Is The Flow Of Ecstatic Dance? Roughly speaking, a good Ecstatic Dance will often present several peaks or waves of emotion that can be experienced as a “birth and death” cycle. The music will almost always start at a low volume, energy and tempo range as people wake up their bodies. As the tempo and energy increases, there is usually an ecstatic moment of catharsis, with the group peaking in energy and movement together. After that high point, the energy subsides back down to a resting place that becomes focused more inward. There can be one single wave across the 2 hours of the event, or several, depending on the DJ. Here is one way in which the Ecstatic Dance community has described their wave in 6 phases. I have provided audio examples from my new album, which contains 17 original songs that cover the full ecstatic dance journey. Arrival: gentle. awakening. graceful. flowy. innocent. stirring. Buildup: driving. insistent. throbbing. thrusting. playful. intensifying. rising. Peak: wild. surging. chaotic. orgasmic. soaring. Landing: airy. lyrical. angelic. nostalgic. flitting. These tracks carry the dancers down from the final peak into the heart. Integration: peaceful. still. drifting. fulfilled. All of the songs in my album “Love and Shadow – An Ecstatic Dance Journey” are designed to be used by DJs, with each one providing a different purpose in the wave of a night. What kind of music is played at Ecstatic Dance? Musically, ecstatic dance can be very diverse. It requires that the DJ be able to weave together a wide range of styles and tempos. Generally you can expect music in the electronic genres, especially Bass, House, Tribal, and Trap. Most people come to these events to really let loose, free their minds, and move however their bodies want to move. The DJ has an incredible opportunity to curate the emotional arc of that journey with anything you want. Typically this will include some hard-hitting music from a variety of genres, but also very soft pieces of music and even instrumentals that really drop people into their bodies. It’s this wide dynamic range which produces the experience of ecstasy and catharsis. Several years ago, I was super burned out on club culture and only playing one style of music. I also made the choice many years ago to cut out drugs and alcohol from my lifestyle and found that to work well for my personal body type. Without stimulants, it can be really hard to stay up through late nights and keep your energy synced up with the crowds, so I took a break from touring and largely stopped DJing out. Fortunately I discovered 5 Rhythms and Ecstatic Dance, where I began to dance again myself. It was through the process of re-discovering my own bliss that I became interested in playing for others again. I volunteered to play for the local San Francisco dance, and it felt like everyone really enjoyed the experience. With a background in house and techno, I tend to play the arc differently than most DJs – which seemed to be a welcome change. I loved the ability to play a wide variety of music, all of it being high quality stuff that I personally love and want to dance to myself. Too many times (especially in the commercial world), – DJs are forced to play popular music repetitively that we just don’t like. In this format, popular music and words are generally used very sparingly, with the emphasis appropriately being on quality and the impact of the songs. It was such a welcome change to play with a group of people that are also sober, alert, and ready to tear up the dance floor in a fully conscious way. Today, I play 1-2 dances per month in cities around the world. They are much more grassroots and underground than clubs, but I love the community feel which comes with such a small intimate world. Crowd sizes can range 20 people to 500 but typically are around 100. DJs are expected to play the full wave of music. A single set of house music, for example, would not go over well. This is a very grassroots, health, and wellness oriented crowd. While it’s gaining wider traction, there are a lot of new age elements present, which might make some people very uncomfortable. Dancers are given full permission to move however they want/need. This can sometimes include making noises and moving in very unconventional ways. It’s edgy and beautiful, but may also be uncomfortable for some. There was a time in my life where events like these were simply not appealing at ALL (to put it mildly). Now, as I have gown older and loosened up considerably, I love to look out of see a group of grown men beating the floor in ritualistic fashion, and smile at the beautiful absurdity. There is a time and place for everything, and I suspect for many older DJs out there, this might be just what you have been looking for. Others might find themselves judging and hating every element, wanting to run out the door. To get involved, I would encourage all DJs to break out of their comfort zone and attend a local dance yourself to experience the process yourself. A complete list of all dances can be found here.Once there, ask who the local organizer is, and see if there is a way to submit your mix to be considered. You can get all the songs from my album, as well as many other music tools from the new record label Ecstatic Dance Records, which was been founded to provide high quality music in this format.